The KIBO Sound Record/Playback Module allows a child to give KIBO a voice! This is a wonderful tool to expand role play with KIBO; and in the classroom it can help KIBO to explore literacy and language development, bilingual education, music, and more! The module plugs into one of KIBO's module sockets. Using the three different buttons -- triangle, circle, and square -- kids can record three different short sound clips. 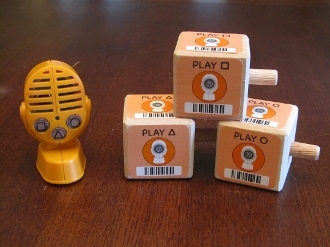 Kids program KIBO to play back the sounds using the three included command blocks, with matching shapes. Please note that KIBO robots sold prior to December 2016 will require a one-time, free firmware update to use the Sound Record/Playback Module. The Module will come packaged with the USB cable required to connect KIBO to a Macintosh or Windows computer to install the firmware update.